ON a cloudy September Sunday, I attended a Day of Mindfulness, led by the incredible teacher, Thich Nhat Hahn. His dharma talk examined the nature of suffering, that most human experience that grounds us all. By focusing on the present moment, he said, we provide the space in which we can focus on our suffering, to cradle it as we would a small baby. By paying attention to what pains us, we can transform that suffering, into compassion – for ourselves. This compassion is the foundation of happiness, joy; a base for healthy communication and compassion for others. Without this mud – this suffering – there can be no flower – joy, happiness, and compassion. This last year has been very, very muddy, and I am looking for flowers, for trees, in fact, with root systems to stop the erosion of this rainy life season….And I keep smacking into the words of Thich Nhat Hahn. The suffering inside us contains the suffering of our ancestors, who may not have been able to transform their suffering…and transmitted their unresolved suffering to us. If we are able to understand that suffering and thereby transform it we are healing our parents, our ancestors, as well as, ourselves. I have found the mindfulness exercises to be moments of peace and comfort. I focus on my breathing and in that space acknowledge my sorrow. I don’t always feel better, or happy, right then. But I can tolerate the pain, and see a path forward, and with relief know that I will heal, and joy will come. This Thanksgiving day I am grateful to have experienced human compassion, a listening ear, a tight squeeze of love. I am grateful, too, for the opportunity to offer that compassion to others, and to my ancestors, as well. Their suffering is the dirt of my family’s trees, and with mindful genealogy perhaps I can transform their suffering into understanding and compassion – for my grandparents, my parents, for me, for my present companions. This series digitizes a set of postcards collected by my grandfather Donald C. Minor from 1906-1910. Born in Greene County, Pennsylvania in 1902, Donald was the youngest son, youngest grandson and youngest cousin of the Francis Marion and Mary Jane Gwynn Minor clan. 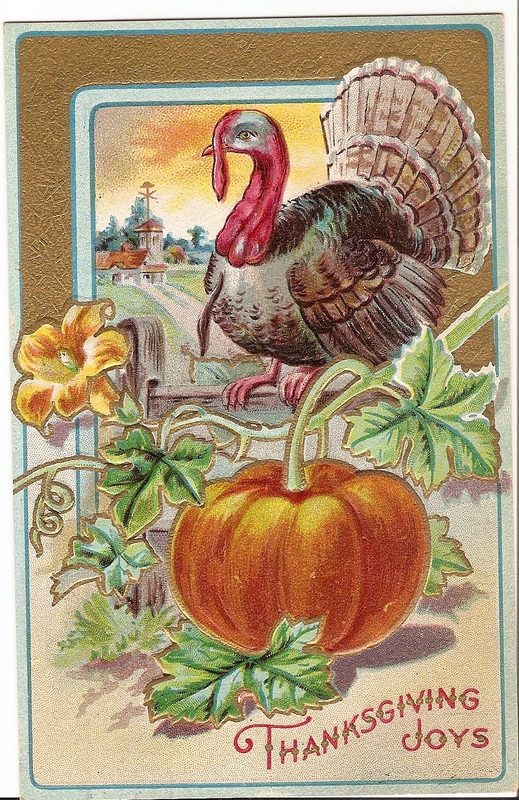 His parents, Robert and May Stephenson Minor, sent cards from their travels; his older sister, Helen, sent cards while she was attending school in nearby Waynesburg; aunts, uncles, cousins, and friends sent photocards and holiday greetings from all over the United States with great regularity. The resulting Postcard Collection is both a family puzzle and a cultural window to the world of Donald Minor during the first decade of the twentieth century. 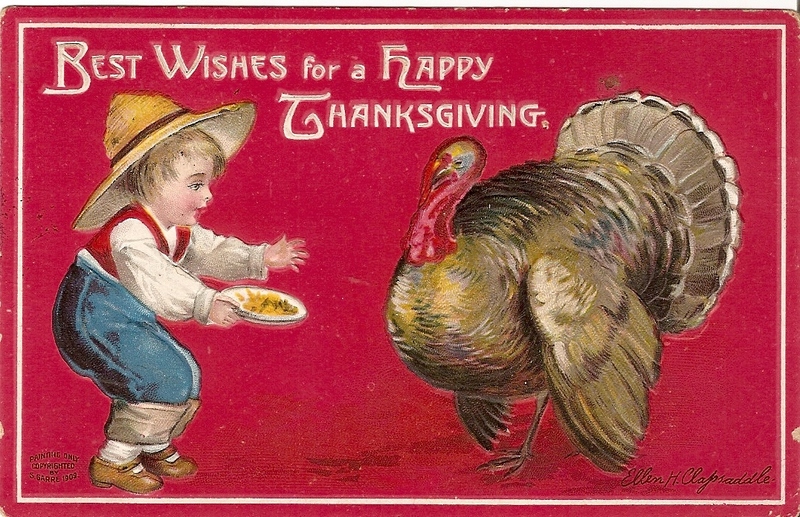 This postcard is a signed Ellen H. Clapsaddle masterpiece, though I must admit to a being a mite bit confused by the subject matter – why would the sight of a child luring a wild turkey to the Thanksgiving table be considered a suitable way to extend Thanksgiving greetings? In spite of this bemusement, I love the cards lush details and vivid colors. Born in 1866 New York, Ellen Clapsaddle was trained as an artist and was one of the few women who actually found a commercial outlet for her talent. Hired by the Wolf Brothers, a subsidiary of the International Art Publishing Company, Ms. Clapsaddle was a prolific postcard artist, with over 3000 designs patented in her name. Mr. Samuel Garre, manager of the IAPC, maintained a 1909 copyright for the painting, which was printed on postcards in their German factories. Dear friend, Come over and eat this turkey with us! The scan hardly does this beautiful card justice. The pumpkin and its vine are both embossed and outlined in reflective gold, accentuating the impression that the vine is in front of the fence. The Eastern Wild Turkey is also embossed, though less so than the pumpkin, and is accurately illustrating this species – its face flushed blue from excitement, the beak’s long fleshy snood and throat’s wattle a brilliant red. Finally, flat with no embossing, a lane leads from the turkey to a distant farmhouse. Such depth of field!